Reiki as a technique is approved by the Masters of Light since it’s the healing Energy of the Absolute, However, a very small number of reikists know how to channel that Energy and almost all of the reikists are spirists of error of the planes 2 and 3, so instead of healing the patients they make them ill.
Reiki is valid when it’s applied by people whose thetans are in the planes of Light 4 or 5 (Spirits of Light) only they can apply Reiki impersonally. Reiki in this sense is almost like Homeopathy it’s like finding a needle in a haystack. Interlocutor: Before to ask you about Reiki I wanted to ask you how the effect placebo works in animals and children? It is a topic that people asked me and I didn't know what to answer. Ruanel: There is no placebo. Ruanel: No. My vessel, some years ago has healed from a spinal column problem to a cat, and he has healed from a brain problem to a baby girl of 8 months and there was no placebo effect. These are healing abilities that my vessel has. Interlocutor: Did Jesus have three healing genes? Ruanel: Yes, he had them. Ruanel: Yes, he also has them, although somehow he refuses to admit it. In an opportunity he resuscitated his own father. Interlocutor: Yes, I know that fact. Is it true what Kumi Ann said that she was offered to embody with the three healing genes and she didn’t accept because she thought that it was a big mission? Interlocutor: Until what age the placebo effect doesn't work in children? Ruanel: Until the boy/girl has capacity to have abstract mind. Making a digression, the famous reactive mind works as well in animals and children, this is already known. The children have a sense of possession and a sense of need they use to “manipulate” their environment when they want food. The boy/girl demands and that reactive mind is a survival mind. The animals are jealous, I don't speak of sexual estrus, but of zeal of wanting, because they want to be the only ones loved, the only ones in affection, and that is ego. The animals have ego, and ego can be only in analytic minds. So animals somehow have very primitive analytic minds. Interlocutor: And in that small percentage of analytic mind the animals and the babies have, let us say 5%, there is not possibility of placebo effect? Ruanel: No, there is no possibility of placebo effect in a baby of eight months because at his age there is no reasoning, and the animals don’t have it either, because an animal doesn’t even realize if they are putting some drops in the water. Interlocutor: In conclusion, the healing of babies and animals has nothing to do with placebo effect at all, but a channeling that the healer does with the Healing Energy. Is that correct? Interlocutor: Well, this topic is also clear. Can we move on to Reiki? Interlocutor: Well. The first question is: What is Reiki concretely, maybe a placebo effect? Ruanel: No, it is not a placebo effect, but a channeling of the Healing Energy, the Universal Energy, the Energy of the Absolute, and it is transmitted to the sick person by the reikist. Interlocutor: Not the Chiristic Energy, but the Energy of the Absolute [Eon]? Ruanel: Actually, most of the reikists don't know how to channel the Christic Energy, but while they are wrapped in Light, the positive Energy they transmit is the Energy of the Absolute which is the easiest to channel. Interlocutor: Let’s see if I understood: it doesn't matter what Energy it is, let us call it Cosmic Energy, Does this Cosmic Energy pass through the reikist and goes to the patient? And meanwhile the patient himself, also channels in turn also the Healing Energy due to the placebo effect? In synthesis, Is this a double channeling? Interlocutor: What would be the percentage of placebo effect? Interlocutor: So, this means that Reiki is 30% channeling of the Healing Energy of the reikist and 70% the own patient's placebo effect? Ruanel: Correct. But in many cases the reikists have particular problems, in the same way as some mediums put something of themselves in the channelings, therefore, instead of healing the patients, they make them ill.
Ruanel: There are reikists that have abdominal pains, chest pains, for example. Interlocutor: And Are these problems transmitted to the patient? Ruanel: Exactly. And there are reikists that after the healings are absolutely exhausted because instead of transmitting the Cosmic Energy, as you call it, they transmit to the patient their own energy. Ruanel: Correct, they transmit their own ailments. I’ll give you a scoop now, 90% of the reikists work badly, although in theory they know it. Keep in mind that the reikists are in the Spiritual planes 2 and 3. Ruanel: What are they going to transmit, if their own thetans, from the planes of error, are rejoicing with the harm that their 10%s are provoking to these unlucky patients? Interlocutor: So you would never recommend Reiki for my ailments? Ruanel: In the beginning, no, unless the reikist were a person whose thetan is in the planes 4 or 5 and he transmits the Healing Energy impersonally. I emphasize "impersonally"
Interlocutor: So you would recommend me for example to this vessel. Interlocutor: Now I understand: Reiki is valid, but it depends on who is applying it. Interlocutor: In the topic of Reiki there is a very well-known name. I refer to Mrs. Hawayo Takata. Was she healed with Reiki as she says? Ruanel: No, no, because an Energy capable to modify genetic patterns doesn't exist. Interlocutor: Then she was healed by any other thing, but Reiki? Interlocutor: All falsehood about this matter! What about Mikao Usui? 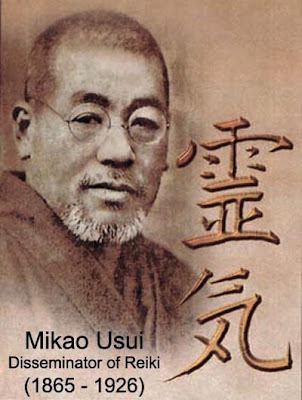 Ruanel: Mikao Usui was the person who broadcasted Reiki. Interlocutor: So Reiki was not his creation? Ruanel: No, not at all. Reiki is millennial. Interlocutor: Now I understand. The name Reiki is simply a name to denominate the channeling healing Energy of the Absolute [Eon]. Ruanel: Correct. There are many other techniques, each one with a different name and they do the same thing. I will give you a silly but very clear example: it is as if somebody manufactured soda water and then he sells it to several companies and each one of them label the soda water with their own trade mark, nonetheless the soda water is always the same, with the same flavor. Interlocutor: The example is very clear. Ruanel: Each technique that uses the Healing Energy hardly varies from the others. Interlocutor: I understand. But what is that whole matter of “initiation”?, first level, second level, third level. Is it something necessary or simply a bluff? Ruanel: No, it is not a bluff. Each level is necessary because it goes according to the knowledge that is taught. But no ceremony is necessary. Ceremonies are religious nonsense. In addition, the word "initiation" is deceiving, and it sounds to me as if the practitioners would find the best technique in the galaxy, and it is not like that. The initiation is nothing more than sheer arrogance. Interlocutor: Let’s see if I understood: If I were to learn Reiki, what would they teach me? Ruanel: They’d teach you postures, they’d teach you breathing, they’d teach you ways to channel, that is to say, putting the mind "in blank" Every year, according to the level of the course, they teach different methods. Interlocutor: Is It valid all of that? Ruanel: It is valid as for the theory, but the reactive mind of the reikist operates against the technique. Besides, they lately invented a fourth level they have called "Master" and that is only what you said: marketing. In the future they will surely invent more levels. Interlocutor: But Are so many years necessary to learn how to operate the Healing Energy? Ruanel: There are courses. They are given per year, but in fact it’s not necessary a year to learn it. It is the same thing when you call an hour of class at school, but in fact it is 45 minutes. Interlocutor: It is clear. Do you perceive from you plane schools where practitioners channel correctly? Ruanel: There are many places in Japan where it’s made correctly and where they teach fundamentally to depersonalize. This is something that Reiki schools don’t do, they don’t teach to depersonalize, because they don't know what EGO is. Ruanel: Speaking in an understandable lingo, the topic is to be dispassionate. The problem with reikists is that they apply it with passion, and passion generates internal conflicts that the reikists finally transmit to the patient. Interlocutor: In Argentina, aside from Jorge, is there somebody else who applies this healing technique correctly? Ruanel: Yes, of course, there are dozens of people that do it well. Interlocutor: What is the percentage of reikists that apply the technique correctly? Interlocutor: It is very little. It is almost as finding a needle in a haystack. Ruanel: Correct. But even though the percentage is tiny, we don't have to discredit all of them for that reason. Ruanel: At this moment I visualize young girls that have three or four months of study and they are applying Reiki already and they are transmitting to the patients much of themselves. There are some of them, for example, that while they apply Reiki, they are thinking about their boyfriends and suddenly they get excited and they transmit that excitement to the patients, not sexual excitement, but only excitement, pure excitement. And maybe the patient has a serious emotional problem and when the reikist transmits to him more excitement that provokes that the patients after the therapy feels a tremendous anguish. Interlocutor: The key question is: how does a person who wants to be cured by the Healing Energy do to find a good reikist? Ruanel: It is totally eventful. Interlocutor: I understand. And about Homeopathy, how do I make to find, not only a good homoeopath, but also a professional who finds the exact substance I need? Ruanel: It is absolutely difficult, almost impossible I would say. The homeopaths, for example, when they have a nervous patient they always prescribe him/her agrimony, because it is suitable for the nervous system. And it happens that the person has nervous problems because of other symptoms that caused that dysfunction and he/she needs another kind of flowers. But this negligence or unskillfulness is not surprising because everything is like that. In the traditional Medicine the same thing also happens. There are many bad diagnoses. Interlocutor: The point is clear. I would say that Reiki, as Homeopathy guesses right in the target as one would hit a target in the air. Ruanel: Unfortunately that is correct. Interlocutor: Well, I believe that the issue about Reiki is clear. Do you want to add something more? Ruanel: No, not for the time being. This entry was posted at Tuesday, November 17, 2009 and is filed under Therapies . You can follow any responses to this entry through the .